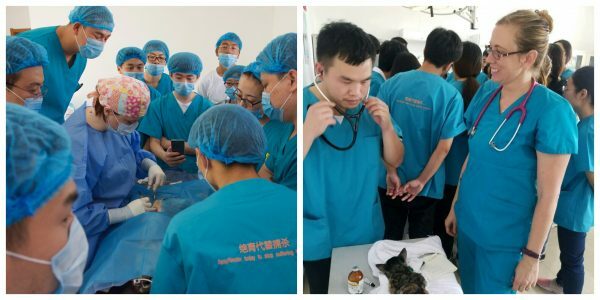 Two members of the Society for the Prevention of Cruelty to Animal Los Angeles (spcaLA) veterinary staff journeyed to China to share spaying and neutering expertise with veterinarians in the city of Dalian for the “Spay Today, For a Better Tomorrow” summit. Dr. Amy Land and veterinary technician, Christina Lebo traveled at the invitation of the Duo Duo Project, an organization committed to ending the Chinese dog meat trade. Dr. Land along with Dr. Monica Rudiger, founder of Nine Lives Foundation, trained 25 veterinarians on high-volume spay and neuter techniques. Ms. Lebo led training in anesthetic monitoring and surgical assistance. The training took place at an animal shelter in Dalian with a population of about 500 dogs and cats. After one day of lecture and a half-day of demonstrations, the veterinarians then performed spays and neuter surgeries on their own with the assistance of Dr. Land and Dr. Rudiger. In addition to bringing better health to the animals residing in the Dalian shelter and curbing pet overpopulation, spaying and neutering will also reduce the “supply” of dogs used for the meat trade. Duo Duo Project and Vshine, two non-profit organizations who are working to prevent animal cruelty in China, made the trip and training possible. This is the second goodwill spay/neuter trip for spcaLA veterinary staff. In 2012, the spcaLA Director of Veterinary Services and staff travelled to Sri Lanka to share spay and neuter expertise.